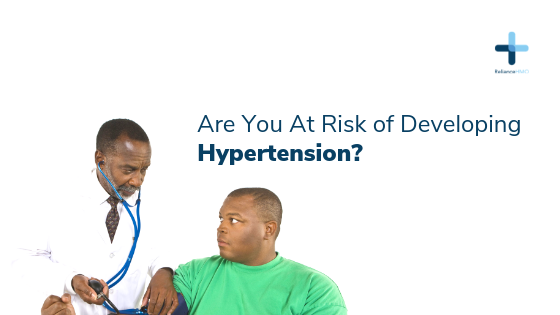 Are you at risk of developing hypertension? Hypertension is sustained abnormally high blood pressure which is confirmed by measurement by a doctor on two or more clinic visits. Every human being has a risk of developing hypertension over his or her lifetime, no matter how small it is, and this risk increases as he or she advances in age, significantly hitting as high as 90% (9 out every 10 persons likely to develop hypertension over their lifetime) after the age of 55 in men and 65 in women. Hypertension is classified as primary or secondary. Primary hypertension accounts for between 90 to 95% of all cases of hypertension in adults. Primary hypertension has no single identifiable cause; it develops as a result of the genetic predisposition of the individual to hypertension interacting with various factors in the environment that promote an abnormal rise in blood pressure. This occurs gradually over many years during which the person may likely not be aware of it because it usually does not manifest symptoms unless a complication like a stroke or heart attack occurs. Secondary hypertension accounts for only 5 to 10% of all adult cases of hypertension. This class of hypertension has one or more identifiable causes, meaning proper treatment of these causes can lead to a permanent treatment of hypertension. Causes of secondary hypertension include chronic kidney disease in people who were not previously hypertensive, long-term obstruction of any point along the urinary tract, severe narrowing of the arteries supplying blood to the kidneys, diabetes mellitus, certain diseases of the blood vessels, pregnancy-induced hypertension, some brain tumours, certain drugs like cocaine, alcohol, and so on. Secondary hypertension occurs suddenly, is characterized by a very high blood pressure and manifests signs and symptoms. The likelihood of developing hypertension in your lifetime depends on how prone you are to the risk factors for hypertension. These risk factors are divided into non-modifiable and modifiable risk factors. Age: your risk of developing hypertension increases as you advance in age and there is nothing you can do about this age-related risk. After the age of 55 in men and 65 in women, this risk rises to about 8 to 9 out of every 10 persons likely to develop hypertension before they die. Race: black people have a higher risk of developing hypertension compared to people of other races. They are also more likely to develop complications like stroke, heart attack and kidney failure from hypertension than people of other races with hypertension. Family history: if any of your parents or grandparents or family relatives had or has hypertension, you are at a higher risk of developing hypertension later in life compared to someone with no family history of hypertension. This is because you might have inherited the genetic predisposition to developing hypertension which runs in your family. While every human being has a risk of developing hypertension over his or her lifetime, everyone can significantly cut down this risk as he or she advances in age with the right lifestyle modification. Adopting a healthy lifestyle comprising regular active physical exercise, healthy eating (including fruits and vegetables), reduction in salt intake, stopping cigarette smoking, cutting down alcohol intake, getting adequate sleep (at least 6 hours of sleep every night), and regular checking of one’s blood pressure–these are the best and safest ways to significantly reduce one’s risk of developing hypertension in their lifetime. Next Post Next post: What you should know about urinary incontinence.